Chances are that you arrive in Germany by plane at either Frankfurt-Main or at Frankfurt-Hahn. If you arrive at Frankfurt-Main, you can take a train right at the airport to travel to Trier. Detailed timetables and fares are found on the homepage of Deutsche Bahn. Tickets may be booked at this site, or bought at electronic booths at the station. If you arrive at Frankfurt-Hahn, you may take a shuttle bus from the airport to Trier main station. Shuttles leave approx. every hour, see the timetable. Advance online booking is advisable, though tickets may be bought with the driver, too. Other airports in the larger vicinity include Airport Cologne-Bonn, Airport Saarbrücken and Airport Luxembourg. The train station is 1 km from the city center, where you will most probably be accomodated. 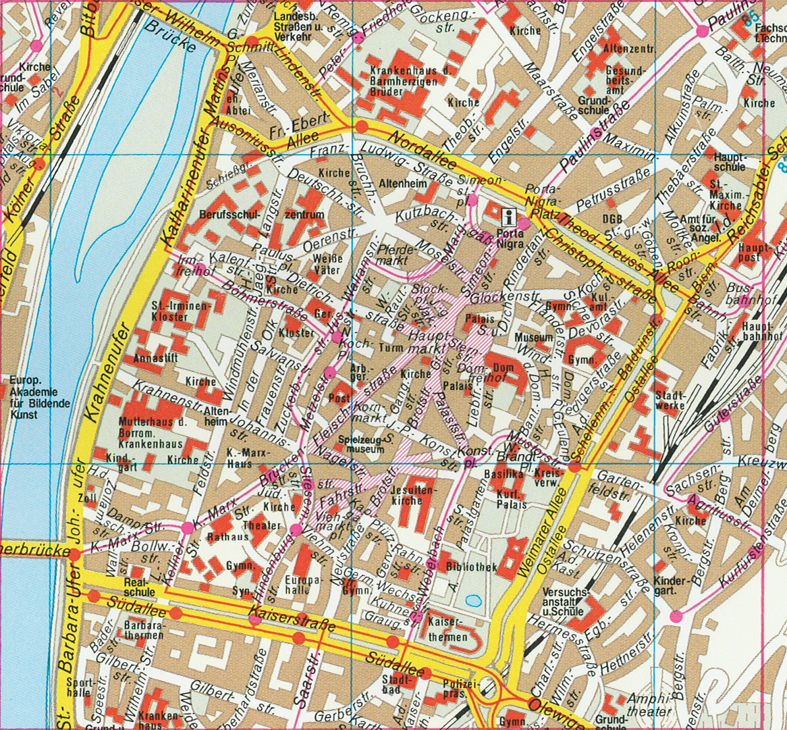 On the map below, the main train station (Hauptbahnhof) and the bus station (Busbahnhof) are located on the middle right border. Also see google maps for this segment. Note that upon booking accommodation with the Trier convention bureau, participants will be sent a tourist guide & map of the city. LATA 2010 will take place at Trier University, Campus II, which is located atop Petrisberg, an elevation slightly off the city. Bus route 14 commutes on a half-hourly schedule between there and the city center. This bus stops at Porta Nigra (boxed 'i' in the map above) and Hauptbahnhof. (high-resolution image) Trier is considered the oldest city of Germany and offers a lot of cultural diversion, including several UNESCO World Heritage Sites. See the city's tourist information and the Wikipedia entry.